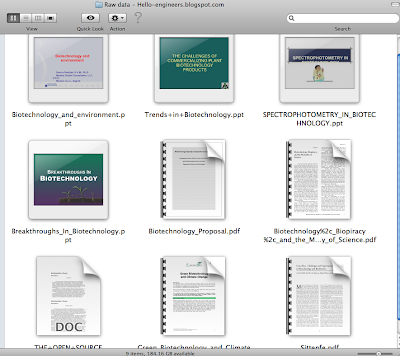 Biotechnology paper presentations ~ Engineering projects ideas for final year students & paper presentations collection blog. This is an paper presentation helper. For sometime i find people interested in biotechnology struggling to get there informations and study materials online. And the main thing i found in these students is that they all are wanting trendy paper presentation and seminars. Preparing such paper presentation for every individual is tougher from a point but even such prepared stuff are not satisfying the need of our engineers because of these drawbacks. we are trying to upload some raw data and information in PDF format. Try to use them and create your own presentations. Even prior to the emergence of specific applications, biotechnology is restructuring the way we think, the values we live by, and our imaginings. The new DNA language is becoming a basic mode of talking about the living world, which includes us. The DNA language has the power and the capacity to wipe out the history of the problems we suffer and to obscure what really needs to be done to deal with them. This is not an accident. The real achievement of the new biotechnologies is that social control is so much a function of the fragmentation of living systems. What you are imagining is choice, but what is happening is control. You may have u read about pharmaceutical companies investing in the human genome project. All the scientists have done is DNA screening of the human genome, but converting those bits of our life into DNA language becomes in effect the creation of life, and those fragments are made available by appropriation for the pharmaceutical industry, which is already starting to bid for patents and control. These are just raw data PDF collected from various online sources , on Biotechnology! Try to use these information to create your presentations. If you still need and help on topic selection and paper creation.